It is a common form of headache where there is paroxysmal, episodic headache typically but not essentially affecting one side of the head. It may or may not be related with nausea, giddiness, vomiting or visual impairment. Pain is typically extreme and lasting for half an hour to more than a couple of days. The attacks of migraine tend to be recurring and the severity of attacks typically lessens as the patient ages. Certain foods and Beverages for instance red wine, chocolates, alcoholic drinks. It often starts during the adolescence, early adulthood or even childhood. Postdrome- This takes place after a migraine attack. In this stage the patient may feel washed out and drained. Migraine with Aura (Classic Migraine): This is characterized by neurological phenomenon that is experienced 10 to 30 minutes prior to the headache starts. The common symptoms may include hallucinations, visual disturbances or even temporary loss of vision prior to the headache. Migraine without Aura (Common Migraine): Here the patient does not experience any aura prior to the headache. Nausea and vomiting frequently come with this kind of migraine. Lethargy and general fatigue may be experienced ahead of the headache begins. Homeopathic medicines for Migraine act on the body at the level of immunity and reinstate the deviated function. They also help to control the symptoms of Migraine devoid of any side effects. The medicines have to be specific to every person. That is the reason a thorough history is required to customize the treatment for Migraine. 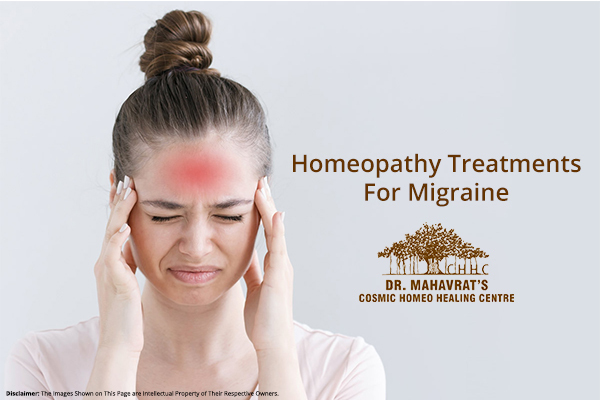 The Homeopathic treatment for Migraine is planned after a detailed analysis and review of the past treatments for Migraine and medicines for Migraine taken by you. The homeopathic medicines so used are aimed at curing the disease from the root and not superficially so that it does not reappear.